Researchers from Sandia National Laboratories have used pressure instead of chemicals to fabricate nanoparticles into nanowire-array structures, just like those that underlie the surfaces of touch-screens for TVs, phones, computers and sensors. The pressure-based fabrication process is performed in nanoseconds. Chemistry-based industrial techniques take up an increased amount of time. It's a new technology that mimics imprint processes already used by manufacturers. Only instead of embossing credit cards, we’re using the same type of process to fabricate nanowires or other nano-sized components at ultrashort time scales. 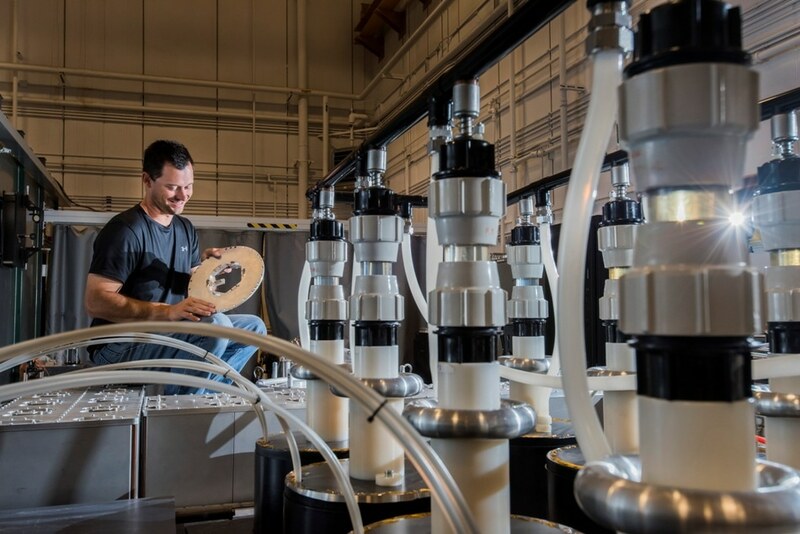 Fan’s colleague, Jack Wise, stated that the method, for which three patents have been issued, is 9 million times faster than any of the known chemical methods executed on Sandia’s Veloce pulsed-power machine. This machine is capable of producing pressures to the order of 100,000 atmospheres. Embossing machines similar to those already being used at a commercial level could be used for manufacturing instead of research. It’s conceivable that few modifications would be needed to convert the machines from embossing to fabrication. The pressure process helps reduce the number of defects common in industrial chemical fabrication of semiconductors, and this process fills vacancies occurring in the atomic lattice of the product. I have never seen or heard of this [process] in our extensive interaction with some of the leading material scientists in the world. It allows us to think of completely new material solutions to problems industry is facing across the board. Tom Brennan, of Chicago-based Arch Venture Partners, speaking in a video about an earlier version of the process. The previous version of the pressure-based process functioned by employing a hand-tightened vise with diamond anvils. That tool failed to be fast and malleable enough for production at a commercial scale. On the other hand, adequate pressure was produced by industrial embossing machines that are also controllable. For a touch-screen, the pressure has to be worked out beforehand to stop the compression at just the right distance from the target: not too far, not too close, to produce the underlying nanowiring for a flat screen. It’s a matter of programming the force applied to precisely determine how much to compress. The nanowires, when used for flat screens, should be flexible enough that they can come into contact with an electrically charged layer of the device when pressed by a finger. However, they remain far enough apart to separate themselves from each other when there is no signal. Recently reported in Nature Communications, the technology is capable of fabricating a wide range of nanoscale components including nanosheets and nanorods. It is possible to disperse the components in solvents for later assembly, or organize the components during their formation. This method can be used for strain detectors, chemical sensors and electrodes in solar cells. Hongyou Fan, a researcher from Sandia, has been appointed a National Laboratory Professor at the University of New Mexico’s School of Engineering in its chemical and biological engineering department. The non-tenure-track appointment, which was effective from March 1, automatically renews every three years and was made in recognition of his significant achievements, according to the university’s award notification. I look forward to the opportunities for development of collaborative programs and student mentoring. Besides Fan and Wise, the other authors of the paper are Kaifu Bian, J. Matthew D. Lane, Gary S. Grest, Tommy Ao and Randy Hickman of Sandia; Zhongwu Wang from Cornell University; and former Sandia post-doctoral fellows Binsong Li and K. Michael Salerno. The Department of Energy’s Office of Science supported the research. Partial research was performed at the Center for Integrated Nanotechnologies, a DOE Office of Science User Facility run by Sandia and Los Alamos national laboratories.